Brrr – anyone else feeling just a tad chilly this MAY? I know I have readers from all over the world, but here in the UK it is unseasonably COLD! 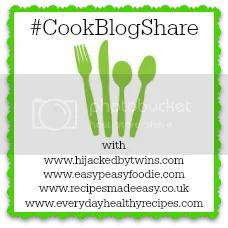 So to warm you up I am sharing with you 4 super soups (see what I did there 😉 ) as well as the linky for #CookBlogShare Week 19. Not only is it ridiculously cold at the moment (well, relatively speaking – it’s not snowing or anything, but it is cold for May in the UK), but time seems to be moving very fast all of a sudden…I think it’s because there is so little time in between Easter and half term – just 5 weeks for us and one of those weeks had a bank holiday in it!! All this means that now that I’ve just about managed to catch up from Easter, I’m already working hard so I can get ahead of myself so I don’t have to work too much in May Half Term…. The other exciting thing coming up is that it will be my SECOND BLOGIVERSARY on Saturday…I can’t believe it’s come round so quickly!! Do keep an eye out for my special blogiversary post on Saturday where I will be looking back on all the things that have happened in my second year of blogging. Now to decide what to do/eat/drink to celebrate – any suggestions?!? So yes, in honour of this rather chilly weather we seem to be having (and apologies to those of you who live somewhere where it is already crazily hot! ), here are 4 rather fabulous soups to warm you up! Not only do they all sound totally delicious, but they all sound souper healthy (#sorrynotsorry) and are all also vegetarian and mostly vegan (in a few you would have to leave off the finishing touches or use a dairy free alternative). So first up we have this rather fab sounding Spiced Cauliflower, Chickpea and Ginger Soup from Debbie at Proper Foodie. Just reading through the ingredients list is making me HUNGRY – the flavours in this soup are some of my absolute favourites! Debbie is also a registered nutritionist and uses her knowledge to ensure her food is properly healthy (no fads here) so you know this is soup is going to be really good for you as well as tasting good! This fab Asparagus and Spinach Soup from Jo at Jo’s Kitchen Larder is a combination of flavours I wouldn’t have thought to put together, but reading through her recipe I can really see how this would work. And what a fab way to finish up half a bunch of asparagus and half a bag of spinach! I always seem to end up with half a bag of spinach languishing at the back of my fridge, so I think next time I might have to make this soup. Next up is this rather intriguingly titled Red Vegetable Soup from Monika at Everyday Healthy Recipes. In it she includes a delicious combination of red peppers, sweet potatoes, carrots, tomatoes and red lentils – plus some garam masala to add some spice – you just know this will warm you up on a chilly evening! And last, but by no means least a total classic…Carrot and Coriander Soup by Jacqui at Recipes Made Easy. Such a great combination and Jacqui’s version looks and sounds so good – plus it is wonderfully easy peasy, not to mention very economical! A great one to do if the pennies are getting tight at the end of the month. She has also given us a whole host of optional variations – I particularly like the idea of adding cannellini or borlotti beans for a more substantial and creamier version! If you wish, you can tweet a link to your recipe to me @easypeasyfoodie and also (if you have room on the tweet!) my co-hosts Kirsty @k_phillipson, Jacqui @jacdotbee and Monika @MonikasRecipes, using the #CookBlogShare hashtag and we will retweet them. You can also post your recipe on the Cook Blog Share Facebook Page. Where did the last year go. Doesn’t seem that long ago I was reading your first anniversary posts. I love soup and these recipes look gorgeous.Fed up with this weather though.I’m desperate for some summer foods too! We’re on the salads here in Ireland the weather has been great for the past week or so. ? Love the sound of asparagus and spinach soup though! Happy blogiversary and enjoy Edinburgh! Thanks for featuring my soup Eb and for the fab write up 🙂 loving the sound of all of these soups, just right for this time of year when the weather is so indecisive.